« I’m Ready For Spring! As I Said Last Week….Come On Spring! Had a couple nice days this week, but today is a whole different day! How do you go from upper 60s one day to low 30s the next!?!? Right now it is 30 degrees with light rain falling. Freezing on windows but not yet icy on the roads. I’m certain that will come as the day goes on. The moisture should be out of here this evening, but the cold temperatures will stay. Sunday looks like low 40s with Monday about the same. Then, Tuesday and Wednesday we might see chances of moisture again, but temperatures a little warmer. Four generators running 24/7 a Table Rock. Certain we will see that for a few more days. When a change does come about, it will probably be cutting back on the current a little as they want to get the level at or below 915 feet. We currently are almost a foot above that. pulled off a pretty good day using lots of different techniques and patterns. The fish didn’t seem to want to see any pattern more than one. A fish on the ruby 2, then one on a black copperhead. How about the pink San Juan or an egg pattern? Show them a JQ streamer, or tiger tail. They worked hard, but did catch several fish and what a great day to be on the water! 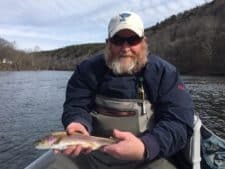 This entry was posted on Friday, February 15th, 2019 at 1:55 pm	and is filed under Fishing Reports. You can follow any responses to this entry through the RSS 2.0 feed. You can leave a response, or trackback from your own site.